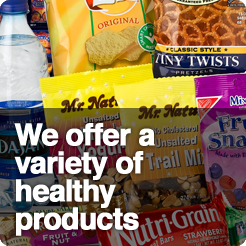 Pinnacle Vending Group carries a complete line of favorite, brand name snacks, beverages and food items. Now your employees and customers won't have to leave your location for lunch or for a hot or cold beverage. And you can always count on us to restock your vending machines on a regular basis so they never run out of your favorite products. Plus, PVG provides FREE maintenance so your machines operate smoothly every time. No matter what size your business or organization, we have a host of benefits to offer -- something for everyone including employees, customers, faculty, students, visitors, members, congregants, or travelers. Snacks. PVG carries an exceptionally wide variety of brand name snacks including chips, cookies, candies, gum and mints, breakfast items and soup. We work with you to make sure we stock the items your employees want. We also offer popular healthy snack options that have less sugar, low sodium, and less fat.. You will love our prompt delivery and same-day dependable service that's always free. Beverages. Quench your thirst with cold refreshing beverages. Choose from our wide variety of quality brand name beverages. PVG also offers healthy beverages like diet sodas, vitamin water, iced teas, and sports drinks. Our clean, modern vending machines keep drinks ice cold and deliver product smoothly. We also provide. Hot Beverage Machines that make flavor coffee, cappuccino, and tea. Enjoy 8oz or 12 oz cup sizes. No mess, no clean, perfect for your break room. Fresh Food. 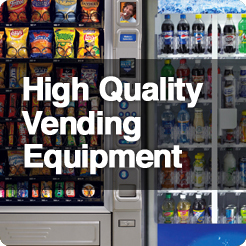 For locations that are qualified for food vending, PVG can outfit your site with food machines that keep you stocked in delicious snacks and meals. We take a professional, proactive approach to giving you top of the line Same Day service. We stock a wide variety clean, Energy Star compliant food machines that can be operated affordably. We will also work with you to customize product selections to meet the needs of your facility. Now employees and customers don't have to leave your location to enjoy delicious sandwiches, fruits or salads, and ice cream. Perfect for evening and overnight shifts, too.